Ever see a ‘signature’ or logo on a photo that identifies the photographer of the image? That’s a watermark! A watermark is a digital signature (or logo) that identifies you as the creator of an image. 1) They send a message that people need to ask permission before using your images. 2) A watermarked image is a way to get recognition as a photographer. Sharing your watermarked images on social media is an easy way to get noticed by potential clients. So make sure any image you post to Facebook, Instagram, etc. have your watermark added! 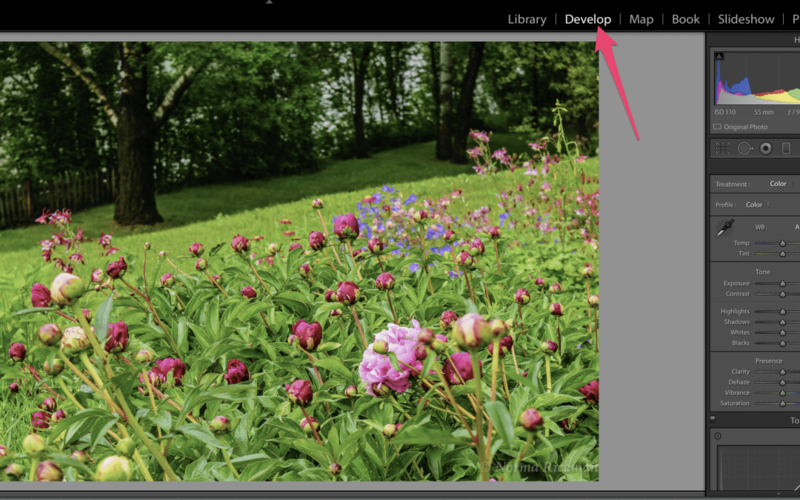 If you use Adobe Lightroom (and you should!) adding a watermark to your images is a simple process. In this tutorial, I’ll walk you through the easy steps to watermark your images with Lightroom. The following video excerpt from my course Lightroom 101 shows you just how easy watermarking your images in Lightroom really is! Now that you’ve watched the watermarking video, here are the step-by-step instructions to watermark your images with Adobe Lightroom. Your logo is the visible brand of your company, so make sure it’s a logo you’re proud to show off. So let’s get started adding a watermark to your images. How to add a text-based signature to your images. Step 1: Make sure that you’re in the ‘Library’ module. Highlight the images you want to apply your watermark on. Resize your images if you wish at this time. Scroll down to the text options settings until you see the box below. White stands out but doesn’t take away from your image. Text Size: Make your font large enough to be noticed, but not so large it distracts from your image! Optional: Change the opacity of your watermark to make it more transparent. Add font decorations like drop shadows to your signature font if you like. Step 5: Choose the anchor point for your watermark. 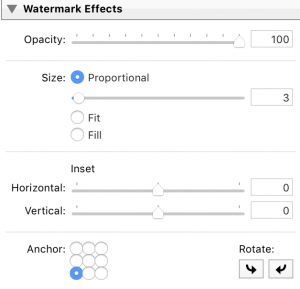 Scroll down to the ‘Watermark Effects’ box. Notice the section marked ‘Anchor. Anchor refers to the position your watermark is placed on your image. There are nine possible locations to choose from. Simply click into one of the circles to select the correct placement for your watermark. Take Care Where You Place Your Watermark! I don’t recommend that you place your watermark over the center of your image, for obvious reasons. The main one is that it just looks bad! The only reason you might want to choose the center position for your watermark is for sending proofs to clients. The reason why you might choose to do this is that it’s more difficult to crop out a watermark located in the center of an image. 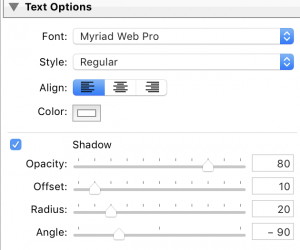 Use the ‘Horizontal’ and ‘Vertical’ sliders to fine-tune the exact placement of your text. Click ‘Save’ when you’re satisfied with your watermark text and placement. You’ll see your watermark added to all the images you chose in the first step. Next, let’s look at how to add a graphic watermark to your photos. This section of the tutorial doesn’t cover creating a graphics-based logo with a program like Illustrator or Photoshop. If you’re experienced with graphics programs, then, by all means, get creative! You might want to do a bit of Googling to find some ideas before you start – but remember to keep it simple. You want to get noticed for your great photos more than you want to get noticed for just your logo! If you’re not comfortable creating a graphic watermark on your own, I recommend you check out my friends at Photologo.com. They’ll create an awesome logo for your photography brand at a great price. So, with that bit over with, let’s get started with how to upload your graphics-based watermark to Lightroom. Have your pre-made logo ready. Upload your graphic watermark to this folder. Select the images that you’d like to watermark. Choose ‘Graphic’ as your watermark style by clicking the radio button. Navigate to the folder where you saved your logo. Click on your logo to upload it to Lightroom. Follow the same method shown as for the text-based logo. Adjust the horizontal and vertical offsets if you need to move your logo a bit. When you export your images, your new logo watermark automatically appears on the images. Now, your logo will be saved as a preset for the next time you export your image. Note: You can save multiple text and image-based watermarks. Just select the one you want to apply before you export your images. Want More Lightroom Tips & Tricks That Pro Photographers Use? 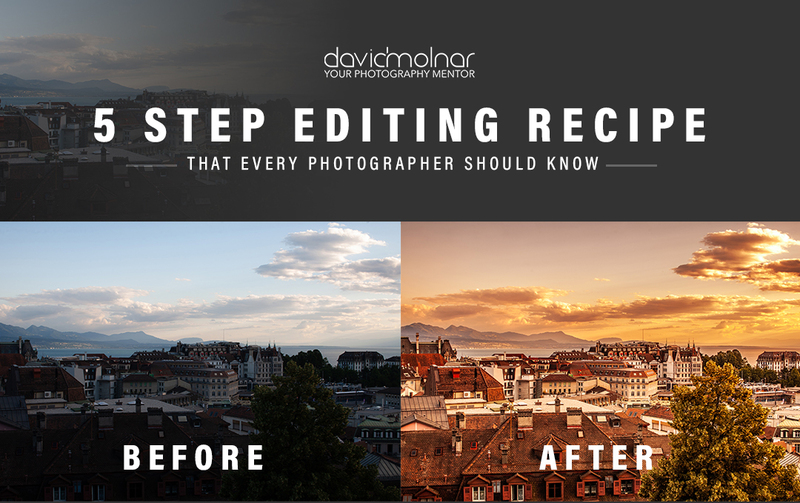 Let me show you my deliciously simple recipe to better editing. In just 30 minutes, you’ll discover how to speed up your editing workflow 10 X! Just click the image below to be taken to the registration page.